Hotel Bastion,- a hotel in Clarion Collection Hotels! NOW: Free wireless network in all rooms available. All rooms Non Smoking. Includes waffles and a delicous evening buffet! Try a luxury weekend,- all De Lux rooms and suites are individually designed,- most have electrical beds, all have delicate bathtub or jacuzzi! 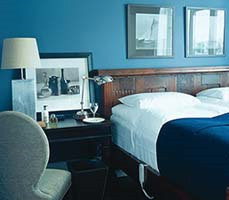 Deluxe room, look for todays price! A rich breakfast buffet and all taxes and services included. We also invite you for waffles in the afternoon,a free evening buffet and free use of our nice relax departement! Clarion Collection Hotel Bastion is , built in 1996 and extended during 2001. The "shell" consists of two old buildings, but everything else is developed according to today's requirements in regard to security and comfort. A key card is needed to get into elevators and corridors.